Take a break with our Holiday Hire boat! A holiday on the canal is a fantastic way to wind down and take life at an easier pace. 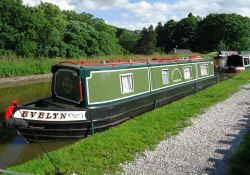 Our 45 foot holiday hire boat Evelyn is now available for short breaks or longer holidays on the beautiful Peak Forest or Huddersfield Narrow Canal; for longer holidays you can navigate the famous Cheshire Ring. Evelyn is a well laid out comfortable cruiser stern narrowboat with 4 berths (2 double berths) and is fully equipped for all your cruising needs – See layout plan and inventory. 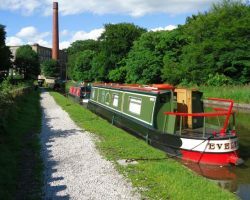 For longer breaks of a week or a fortnight there are a number of routes you can take including: parts of the Cheshire Ring and the Huddersfield Narrow Canal. These run Friday – Friday or Monday – Monday. You will receive a full briefing on operating and handling the boat and its equipment plus you will be escorted on the first part of your journey to allow you time to get used handling the boat; you will also receive full instruction on how to operate and navigate the boat through locks. 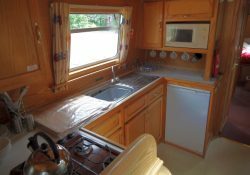 The boat is fully equipped and includes everything listed on the diagram at the foot of this page, plus crockery, utensils and cooking equipment. The boat also has central heating with radiators in the main cabin the corridor by the bathroom and in the master bedroom. Storage space is limited on a narrowboat so it is advisable not to bring too many clothes. The wardrobe space in the master bedroom has to accommodate the clothing for 4 people as the storage cupboard by the dinette is principally a wet locker for outdoor clothing. 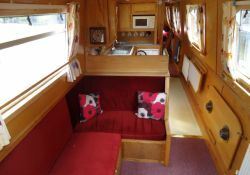 Photographs of the boat and its interior can be seen here. Prices include diesel, gas, bedding, life jackets, all cruising equipment and VAT. Prices do not include charge for pets and additional security deposit. Download a booking form to print, complete and return to us. You can read our Conditions of Hire here. Before your holiday on our boat it will be helpful for you to read the British Waterways Boaters’ Handbook online. Please contact us if you require further information or if you are unable to download and print the booking form.